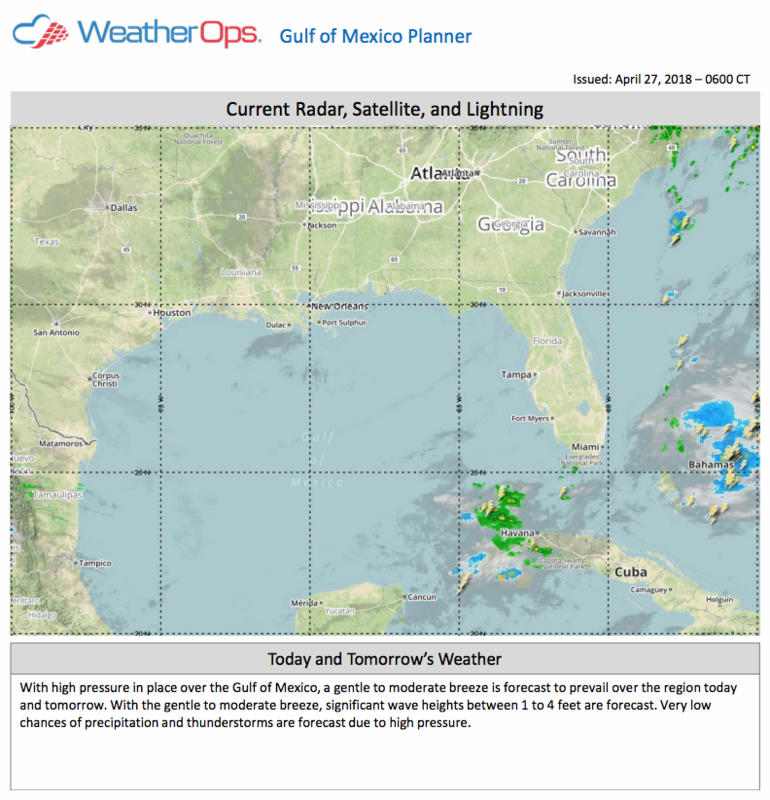 A Gulf of Mexico Planner has been released, joining the WeatherOps Winter Weather and Thunderstorm and Rainfall planners introduced earlier this year. 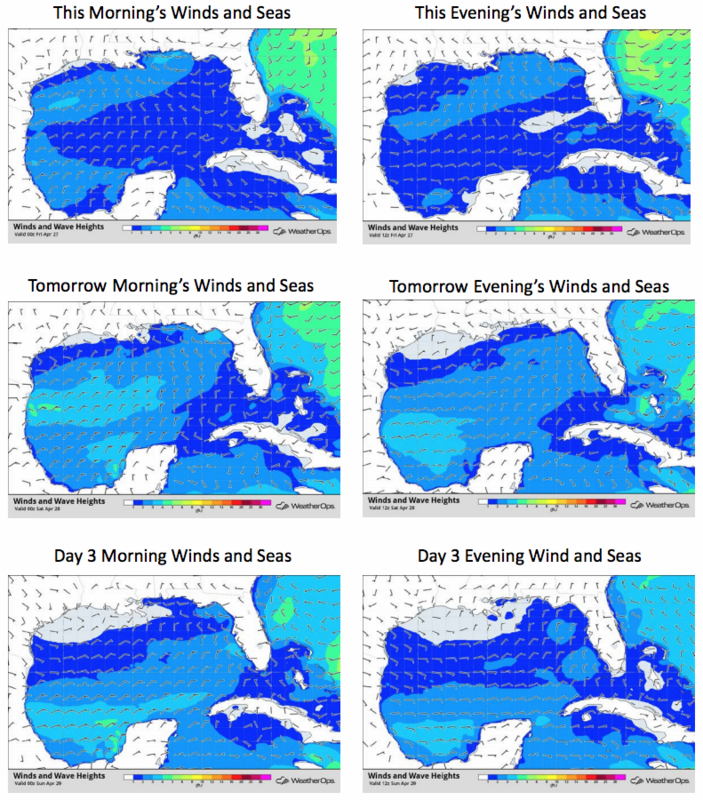 Issued daily at 6 am CT, it features an assessment of short-term weather hazards, surface analysis charts, and new wind/wave charts through the upcoming 2.5 days. Those with assets in or near the Gulf Coast will find this planner valuable. The Gulf of Mexico Planner includes current radar, satellite, and lightning along with a brief forecast for the region. A critical component of managing offshore operations is the ability to identify and assess threats quickly. With just a glance, clients with assets in the area will instantly know what type of hazardous weather may be currently occurring. A 7-day forecast is also included. Knowing the wind and wave heights will assist offshore energy operations, ship transports, ports, and other shore side facilities. This planner includes that information in easy to understand graphics. WDT is exhibiting WeatherOps marine and tropical forecast solutions at the annual Offshore Technology Conference (OTC) in Houston, Texas this week. With the number of active rigs. oil prices on the rise, and Atlantic hurricane season just around the corner, now is an ideal time to reevaluate your weather forecast services and risk mitigation plans. WeatherOps can provide a comprehensive suite of forecast services that fall within your budget. Meet with our marine weather experts at booth 6374 in the NRG arena to learn more!